The weather man said intermittent rain and gray skys. Not an ideal last day in North Dakota, but what I had to work with. 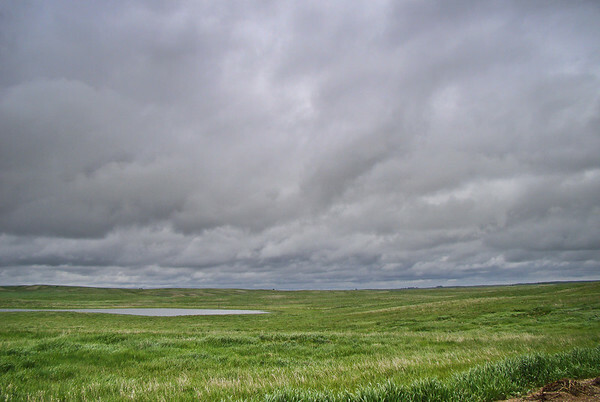 And of course, seen rightly, the lowering sky only adds drama to the vast prairie landscape. This is a classic Prairie and Pothole shot, taken where a road crosses a section of native prairie near Lake Louise and the Chase Lake National Wildlife Refuge in North Dakota. The theory is that retreating glaciers left large blocks of ice on the landscape, which melted slowly and left these more or less circular depressions. They fill with water to form resting and nesting areas for wild-fowl, bringing the prairie to life each spring. Later in the season they remain wet, and provide habitat for many prairie species. In Lightroom, I used two graduated filter effects. One from the top to darken and bring out the detail in the sky, and one from the bottom to punch up (+ Clarity, + Exposure, and + Contrast) the foreground. Globally, I added Clarity and Vibrance and used the Landscape sharpen preset. I just slightly cropped from the bottom and top for composition. From Prairies and Potholes 2009.